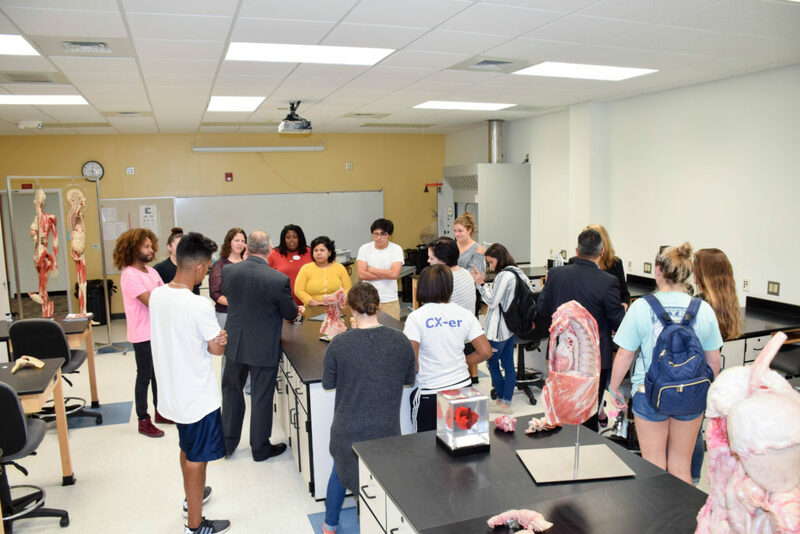 Nash Community College’s Natural Sciences Department hosted an exhibition of plastinated cadavers Tuesday, August 28th for students, faculty and staff to examine real-world human anatomy. 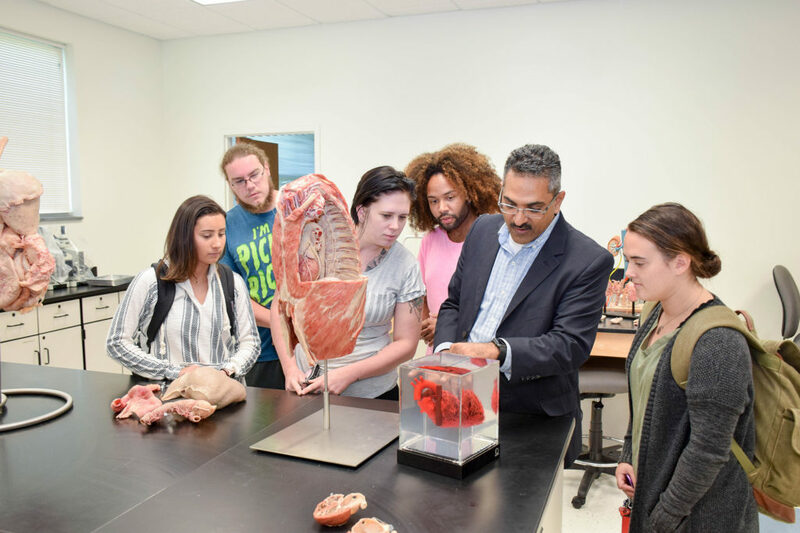 “This is an exciting and unique experience for our students to see the human cadavers on our campus,” Nahel Awadallah, NCC Anatomy and Physiology instructor said. Awadallah’s first in-person experience with the plastinated human cadavers was when he presented at the Human Anatomy and Physiology Society (HAPS) conference held in Columbus, Ohio earlier this year. “What a fascinating and realistic way to engage students with real human anatomy. At best, most college Anatomy and Physiology classes provide a virtual dissection experience where students view the whole process through online video. This allows them to see in-person the images they usually only see in a textbook,” Awadallah said. The full body plastinated cadavers, featured at NCC for a one-time demonstration, can cost $80,000 or more. Awadallah hopes that by bringing in other disciplines such as NCC’s Nursing, Physical Therapy Assistant and related sciences, an interdisciplinary team can work together to secure funding through grants or other support. The exhibit also included parts and systems for student exploration. Use of the plastinated specimens allows students to examine human anatomy from various angles and saves time since there is no dissection and location required, both processes in which only medical students generally participate. “Any students who are taking or plan to take Anatomy and Physiology as a requirement for their program can benefit from examining human cadavers. The images in textbooks often vary slightly from the real thing and may not represent the precise color, texture, placement or scale of human anatomy,” he said. The study of the plastinated specimens can improve teaching, efficiency, medical diagnostic and examination skills, healthcare outcomes and more. “Addressing anatomy education at the most fundamental level contributes to better healthcare and practitioners,” Awadallah said. The human cadavers provide educators and students with a look into human biology, anatomy, and physiology including organs, muscles, the nervous system and skeletal structures. The human body preservation process of plastination, which usually takes about one year to complete, was invented by German anatomist Dr. Gunther von Hagens. In addition to the academic application, von Hagens’ travelling exhibition titled Body Worlds, is internationally known. All cadavers are acquired through a donor program where an individual agrees to donate their body to science, consenting and fully understanding the future use and implications. The primary goal of the exhibit is preventive healthcare through education. For more information, please call 252-451-8235.